they were poorly suited to. 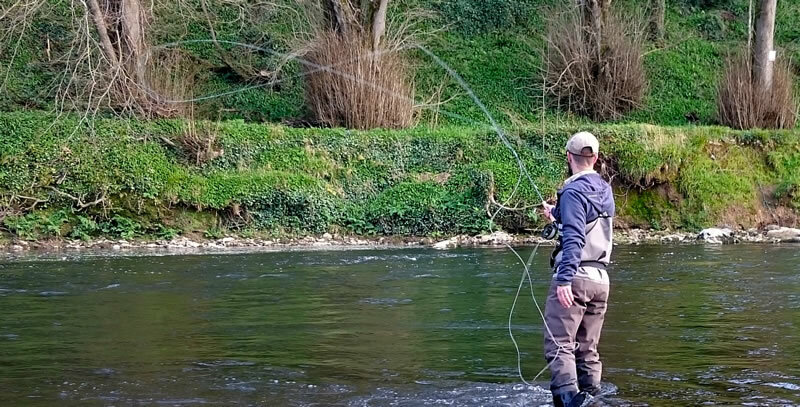 Light Switch rods make for great heavy duty Brown Trout fishing such as casting large streamer patterns and with the right lines achieve a stealthy presentation to spooky Seatrout. 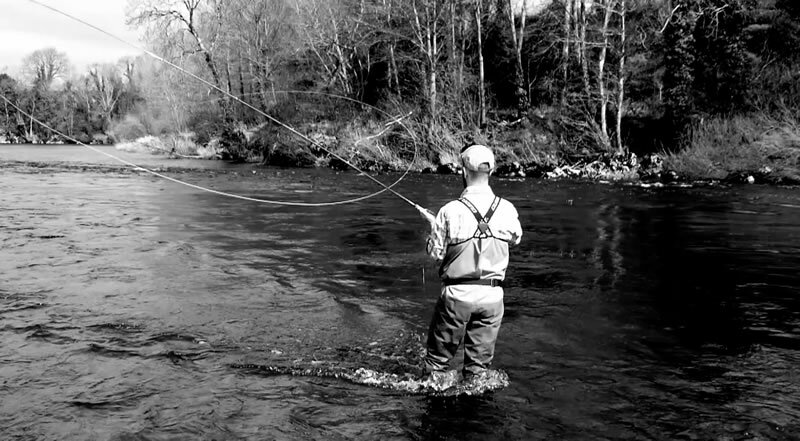 The higher rated switch rods are a great tool for Salmon and Seatrout on smaller rivers and spate streams. The short heads and lines generally used with these rods make them ideal for tight overgrown areas where there is little room. They provide anglers that wish to fish in the two handed style access to much lighter lines classes that previously would have only been available as single handers. Switches rod offer so much fun excitement when it comes to playing a good fish, there is so little rod between you and the fish that every run, head shake and turn is instantly felt and much more dramatic. They are also a source of debate as to what purpose a switch rod should fulfil , single or double handed casting or both, Spey profile lines or weight forwards ? With this in mind I thought I would share my experiences and what works for me with these rods as to the when and where and how. First and foremost a lot of the debate is due to a lack of understanding between the difference between European and US line ratings. Generally European Switch rods are based around the Single handed scale and US rods on the Double handed. Looking at the below examples, which gram weight would you prefer to move around on a long days fishing ? E.g An 11’6 #6 Switch rod based on Double handed scale with a recommended weight of 25grams for a scandi style head. An 11’6 #6/7 Switch rod based on the single handed scale with a recommended weight of 17grams for a scandi style head. singlehandedly though in reality that’s exactly what they are, short doublehanders and I would need arms like Popeye to be able to use them effectively with one hand. Regarding lines, we are spoilt for choice when it comes to Switch rods. Designated lines such as the Guideline’s Switch Multi tip are great if you want a versatile integrated line. The Compact & Triple-D range both have lines rated for switch rods and are hard to beat in my opinion. The new Ultra Compact is going to be a winner especially for those really tight situations. Most of the modern WF lines will speycast and overhead very well just make sure the line doesn’t have and old Wf style profile where all the weight is in the front half of the taper as this means all your weight will be in the bottom leg of your D-loop when speycasting and its just going to make for hard work. A nice balanced taper is best, Guideline has lots of choice my favourite being the Bullet line though the new Fario WF Float, Camo Pro, the 4Cast Range and others all have tapers that will allow for a great mix of spey and overhead casting. All Guideline Switch rods give a line and gram rating making finding a line to suit your requirements an uncomplicated process. Though always remember to factor in your own personal preferences when it comes to rod loading and the type of casting stroke you favour. Choosing a switch rod (line rating) is no different than choosing any double or single handed rod. What Species of fish am I looking to catch in what type of environment and more to the point what size of fish. No need for an 8/9 if I am chasing wild brown trout using streamer patterns or smaller Seatrout at night. This tells me I’ll be looking more likely at a 6 or 6/7 weight rod. I use my Exceed Switch 10’8 #6 coupled for the most part with a matching Bullet line. Though I also use cut back 7/8 SH Triple-D when fishing for smaller Grilse and Seatrout. My Lxi Switch 11’6 8/9 for Salmon on smaller rivers and confined areas and there is no need to worry about hooking a large fish with this rod. Triple-D’s and Compacts with this one and they rock out. No problems putting out a longer line either so could easily be used on larger rivers in lower water levels. Some of my favourite shooting heads & lines for use with Switch rods and the New Ultra Compact thats sure to be a hit. Tip; Don’t be tempted to think that switch rods are only for use with floaters and sinktips. There are some great sinkers available in the compact & Triple density range tailored to these switch rods. Ideal for fishing higher water levels in smaller rivers. Here is a good tip that catches fish in difficult conditions – Summer time, bright skies and low water not ideal. Many fish will retreat to the deeper water just below the neck of the pools where the white water transitions into a smoother flow. There is often a steep gradient change here. The fish feel secure in the deeper water but have good oxygen from the white water just above. Using your switch rod fish a small fly on a fast sinker in these areas and you will catch fish when the river seems asleep during those hot days. The finer tips of the sinking heads in switch ratings give great discretion. It’s a great combination of depth and delicacy not normally associated with fast sinking heads. The triple density nature of both these lines give the perfect angle to the line to fish these areas without the belly catching up on the bottom . I have found it to be more successful fishing from the deep side in these situations normally associated with a high bank and very little casting room, again ideal for the switch outfit. And yes it could be done with a single hander but for those that have a passion for casting with two hands as I do they are the perfect solution.